Slipforming, continuous poured, continuously formed, or slipform construction is a construction method in which concrete is poured into a continuously moving form. Slipforming, enables continuous, non-interrupted, cast-in-place “flawless” (i.e. no joints) concrete structures, which have superior performance characteristics to piecewise construction using discrete form elements. Slipforming relies on the quick-setting properties of concrete, and requires a balance between quick-setting capacity and workability. Concrete needs to be workable enough to be placed into the form and packed, yet quick-setting enough to emerge from the form with strength. Slipform concreting is a fast, cost efficient way to deliver higher quality concrete products, compared to that of say, pre-cast and form work. Kerb & Co can produce a concrete barrier wall of the highest standard. Adaptable moulds means we have the ability to suit most jobs. Specialised moulds can be manufactured to suit your requirements. Concrete barrier on existing barrier. We have Kerb profiles to cover all requirements by RTA, Main Roads, Councils and Shires. Specialised moulds can be manufactured to suit your requirements. The slipform construction of concrete feedbunks has now been established as providing cost benefits for the feedlot beef industry. The Feedbunk is extruded behind a tracked slipform machine, accurately guided by string lines for both line and level. Special low slump concrete is used so that the concrete emerges behind the slipform machine without any support. The trough profiles used have been widely accepted as being very economical. Alternatively, a profile to your satisfaction can be manufactured. Another benefit Kerb & Co Pty Ltd can provide is the installation of posts for the top rail. These are pushed into the wall whilst the concrete is still fresh. This also provides protection for the bottom of the posts which when placed outside the bunk will corrode due to the exposure to cattle urine and other elements. The 3 meter and 1 meter apron can also be slipformed. 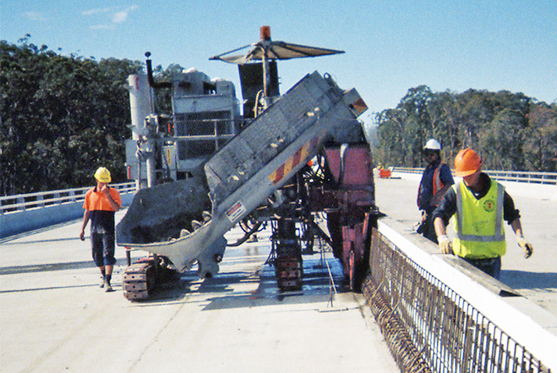 This is the same method used on concrete highways, which is very durable and does not require steel mesh for support.